With the Xbox One release date inching ever closer, one AAA title has come out of the woodwork to reveal when gamers can begin their fight against the Flood. 343 Industries and Vanguard Games have announced that Halo: Spartan Assault will be available worldwide for digital download on the Xbox One and Xbox 360 in December, though an exact release date is still unknown. There's also no word yet on the game's disc release, but come "this holiday" owners of the old- and next-gen Xbox console can sip hot cocoa as they battle for galactic victory. The Xbox One is slated to launch on November 22. Be warned: The game won't be compatible from one system to the other, and multiplayer between the Xbox One and 360 isn't supported. Halo: Spartan Assault has already launched on Windows Phone 8 devices and Windows 8 tablets and PCs, but the game's devs have included some extra goodies as the title heads to console. Among them is an expanded arsenal, meaning more weapons, armor abilities and upgrades. 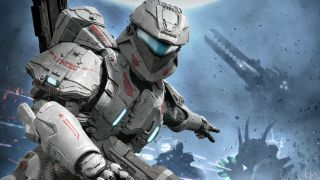 The new Xbox One Achievements add another element to the game, and players will have the chance to earn more than 40 in-game Achievements and medals. The online Co-op multiplayer mode makes for longer missions (and more smack talk), but gamers will need an Xbox Live Gold membership to access it. Price for the top-down action shooter on the consoles is still unknown, but we'll keep an ear to the ground. Just watch our backs - the Covenant may be closing in. Read our in depth, hands on review of the Xbox One right here.